Share the post "Big Blue At Its Best"
For years I have heard the most delightful stories of the happenings at one of the most talked about parks here in Mason City which for some reason doesn’t get as much publicity as one would think due to the number of people who frequent the park as well as fish and swim in its two man made lakes. The park I speak about is Lester Milligan Park which encompasses quite a large area on both sides of South Pierce Avenue. The park really didn’t come into full use until South Pierce Avenue was extended to 19th St. SW back about 15 – 20 years ago. It’s interesting how many people who are transplants to our city discover it all by themselves and likely use it more than the natives. When I was younger, I used to take about 30 – 45 minutes out of my evening and go walk around the larger lake named Big Blue which is on the east side of Pierce Avenue. The smaller one on the west side is called Black Lake. It has darker water in it because Cheslea Creek empties into it and flows on and meets up with Willow Creek as it moves through Mason City. If Big Blue could talk, it would have many stories to tell of the happenings in its waters both in Summer and Winter. Many more people go swimming out there than one would think as well as sunbathing on the south beach. When it really gets hot is when you see more people out there. 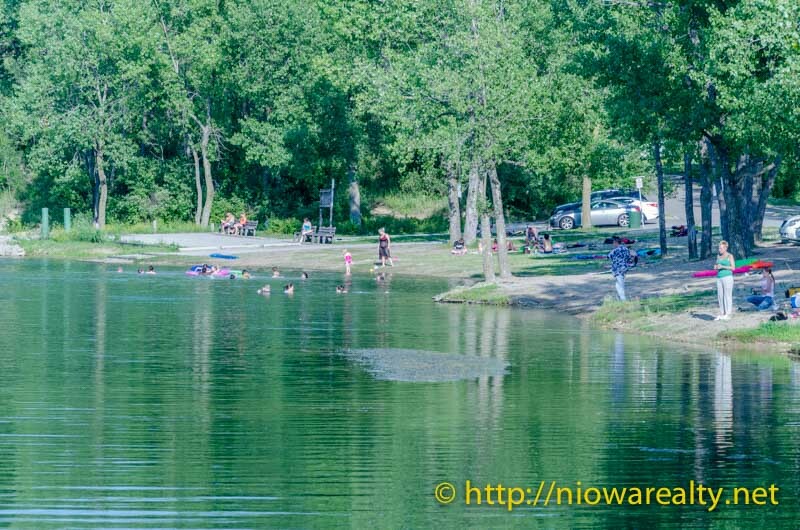 Believe me, Mason City’s Aquatic Center is beautiful and well deserved by our residents, but if you want to just splash around in the water a bit and then go sit on the beach and enjoy nature, Big Blue is the place to go. I’ve seen some pretty big fish that were caught in that lake. Since it is was originally a clay pit, the depth is greater than one would think. I stopped out there today with camera in hand for a few minutes and snapped some photos. Walking around out there brought back fond memories. There is even a stone shelter house nearby where people can picnic. I’ve noticed more and more people walking the trail these past years who’ve as well discovered the natural ambiance. Several of my clients go walking there every morning. I’d rather be walking out there than being trapped on a boring old treadmill any old day of the week. 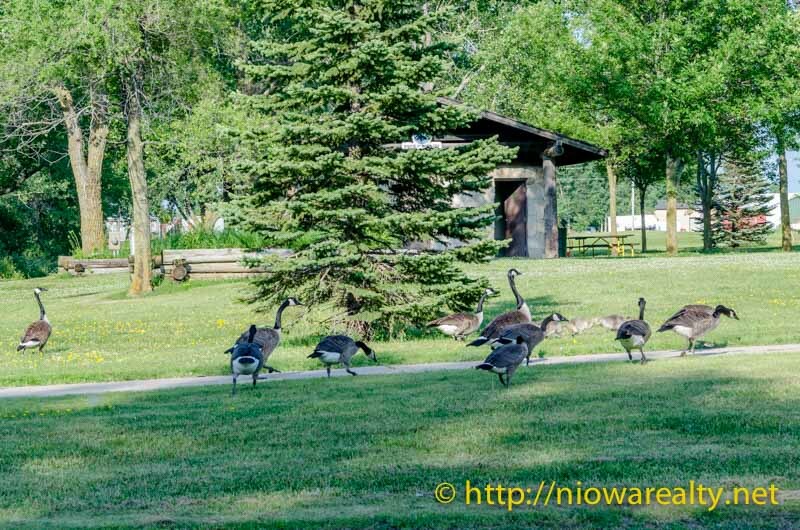 The Canada Geese seem to like to raise their young in those two lakes. I hope every resident of Mason City takes the opportunity this Summer to take a short walk around Lester Milligan Park and see if they will be there a day when they’ll find Big Blue at its best. As I mentioned before, most people don’t realize how fortunate we are to have the great park system Mason City has to offer.